NOSE: It’s a pilsner, so lots of bready, biscuity notes up front. It’s cut through by a remarkably bold hops aroma. Although it’s still grassy as you would expect from the style, it’s much more assertive and citric than other pilsners. A faint aroma of apricots and peaches rounds things out. TASTE: There’s a shocking amount of cognitive dissonance here. The “framework” is a pilsner, so I’m expecting a mild, pale lager taste. But its got huge Imperial IPA notes hitting me from all sides. Every sip begins with a malty, biscuit flavor that is quickly washed away by massive, bitter citric notes. And while the finish has the clean, grassy flavor you would expect, the bitter hop profile never really subsides. It’s like drinking two beers at once. MOUTHFEEL: It’s medium-bodied, but a touch syrupy. Good, sparkling carbonation keeps it light on the tongue. DRINKABILITY: A really interesting beer, but a little too overwhelming and off-balance to be truly drinkable. It’s more of a novelty than anything else, but I’m glad I was able to sample it on draft. Bought a bomber as well just to see if it was any mellower in glass. It was not. Posted in Tasting Notes.Tagged Atlanta, Imperial Pilsner, Magnum IP, Sweetwater. I’m glad you used the word “syrupy” in this tasting note, as that was what bugged me most about this beer. The heavy bitterness ALMOST balanced out the aggressive sweetness for me, but the mouth feel was so syrupy that it kind of tipped it from something I wanted to give another try to something I’m going to leave on the shelf (not that I see Sweetwater on the shelf out here in the land of cascade hops and beavers). It may have been the crisp fall evening spent on my roof deck; it may have been the amazing pork chops I’d just set on the grill; or it may have been the wisps of gold ushering the sun over the horizon. Whatever it was, I liked this beer quite a lot. Far from syrupy or cloying, I found it crisp, bitter, floral, and, above all, completely new. 3 hops for the brew; 4 stars for a great idea. Thanks, Sweetwater! Glad you liked it! I actually enjoyed it more out of the bottle than on tap. It’s possible some of those big notes need a little bottle aging. 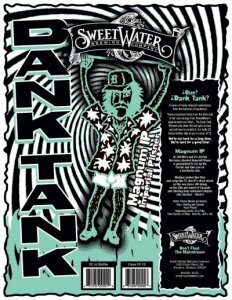 When I drank it at Sweetwater, it was directly from the Dank Tank so it was still a little “wild”. Cool beer though…I just thought it needed some tweaking.